Dr. R Singh Randhawa completed his Doctor of Veterinary Medicine from the College of Veterinary Science in Ludhiana, India in 1995. This is one of the top ranking veterinary schools of India. He did his veterinary license board examinations from the Ontario Veterinary College, University of Guelph Ontario, Canada. Since then, he has been working as a veterinarian in small animal practices in Sudbury, Toronto, Ontario and Royal Oaks Michigan. 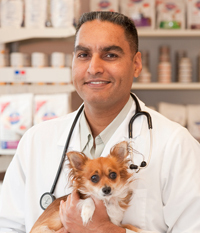 Dr. Randhawa has over 17 years experience as a veterinarian. He loves to read about new topics and techniques in veterinary medicine and keep himself updated by regularly attending Veterinary Conferences, hands on training sessions, and seminars. He is capable of handling a varied case load of complex medical conditions, routine/non-routine soft tissue surgeries, and most orthopedic surgeries. Dr.Randhawa has special interest in soft tissue surgeries. He also believes in giving back, so he donates some of his time and services to many foster agencies, rescue groups, and animal shelters. Dr. Randhawa and his wife, Neeta, live in Windsor with their two sons, Harman and Armaan. In his spare time he enjoys jogging, working out, and long walks. Over 50% of all pet owners would rather be stranded on a desert island with their pet, rather than another person.